A year from #Monster25 but the anniversary of that period’s already started for me and my memory bank— right about 25 years ago, we went down to Mexico to have the inevitable discussion we had to have— tour next record (which didn’t exist yet but some songs were in the works)? …Warners, for whom the band had made significant sums from 1988- 1993 (Green, Out of Time, Automatic for the People, with a market pre-ubiquity) spent some of it on jet fuel to get us to their retreat (house) and we went down for a week to assess, reflect, plan, figure things out . . . record would come out late 1994 and tour would start, as the last one (1989) in January in Australia. We decided on a bunch of things… augmenting with extra guitarists (still TBD), Joe (sound) and Willie (lights ++) on loan from the off-year Dubliners, trying to seat 360 even with some sort of screens and imagery, coming home without writing a check back at the end…the basics of business planning more than a year out from when the action would really begin. And then it all happened: babies were born, a hard record got finished and seeds for the followup were planted, a young and gifted Jim Courier played drums in Melbourne, new trails were blazed in far-flung parts of the world we’d never been, FedEx and faxes, and these new cell-phone things, were our go-to devices, videos got filmed (Star 69 in Singapore was a highlight in its crazy audacity), shows were selling out indoors (summer down under, winter throughout Europe), and out (summer in Europe), songs were written (Departure between Singapore and San Sebastian) …it was all going on, and then March 1, Lausanne, when it all came scarily close to all being over…but fate, luck, Bill, God-given talent of doctors and artists and team and it all somehow miraculously resumed and picked back up— the year took further turns and twists, ended up with a strange and poignant momentum of its own despite all that…. 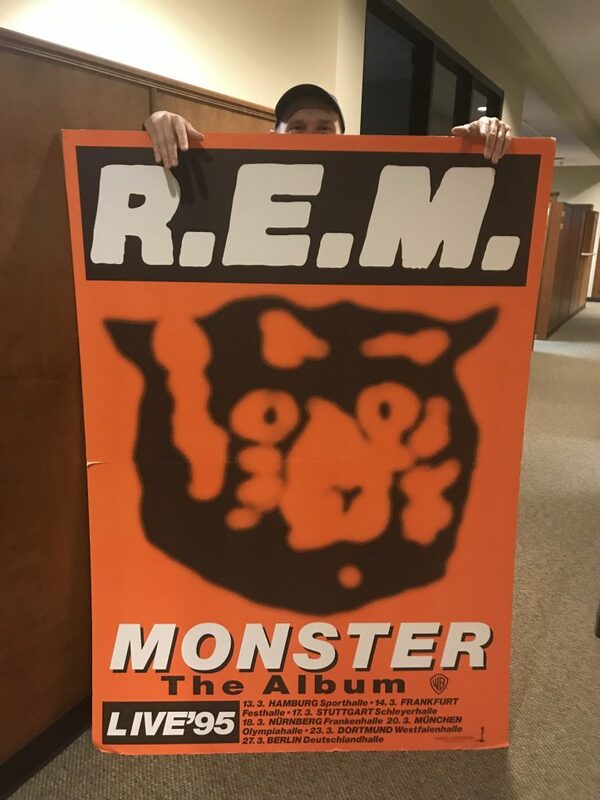 and made it to November with the traditional Thanksgiving shows in Atlanta (the Omni not the Fox Theatre this time) …anyway, 1995 was truly “the year that was” in the history of the band) and in my mind, the #Monster25 anniversary dates to those intense meetings in Acapulco 1993— reissue coming next October, with the 40th anniversary of the whole shooting match year after next! #40REM2020!